My guest on this episode is Dr. Richard Munang, an exceptional bright African mind, a Climate Change expert and the author of the book, Making Africa Work Through The Power of Innovative Volunteerism. He currently works with the United Nations Environment as the African Regional Coordinator of Climate Change and leads the Ecosystem-Based Adaptation for Food Security project across 40 African Countries. The opportunities in Climate Change and how Africa can seize these opportunities. What are the politics of climate financing in Africa? How the implementation of Climate Change policies can be driven by the youths? Some innovative ideas that Africans in Africa are championing to drive Climate Action. Alternative sources of financing and adapting to Climate Change. Did you miss the previous episode with Kenya’s Dr. Mithika Mwenda? Here is the link: http://climatetalkpodcast.com/interview-with-dr-mithika-mwenda/, please listen. 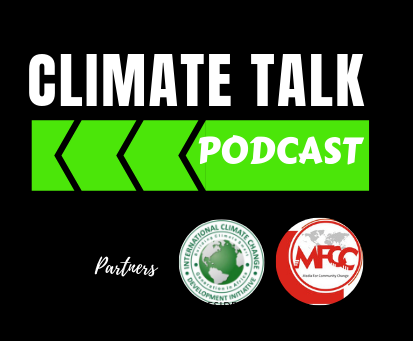 Climate Talk is a monthly podcast hosted by Seyifunmi Adebote. Be sure to check in as often as you can as there will be a new episode published every last Wednesday monthly. This is a project by the International Climate Change Development Initiative and Media for Community Change Initiative. Subscribe here to get updates and other relevant information. Climate Talk is a monthly podcast hosted by Seyifunmi Adebote. Be sure to check in as often as you can as there will be a new episode published every last Wednesday monthly. Copyright © 2019 Climate Talk Podcast. All Rights Reserved.